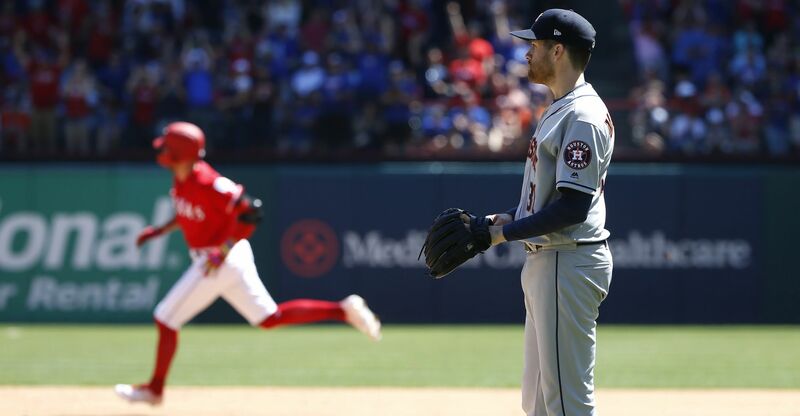 HOUSTON — Last year's World Series title is not the only thing the Houston Astros are defending as they grind through another October. Now their organizational integrity is on trial as they battle the Boston Red Sox in this American League Championship Series. Growing reliance on video and technology is changing today's game dramatically, and the age-old art of sign-stealing has evolved into high-stakes surveillance that some teams appear more willing to take to extremes than others. "This is just the tip of the iceberg with the Astros," one major league executive, who requested anonymity because of the sensitive nature of the subject, told B/R on Wednesday. "They've been doing it for years." The latest controversy exploded during Boston's 8-2 Game 3 win on Tuesday night, when Danny Picard of the Metro Times in Boston reported that a man with a camera had been removed from an area near the Red Sox dugout by Fenway Park security during Game 1 of this series. Yahoo Sports' Jeff Passan reported later that the Cleveland Indians warned the Red Sox of a man caught taking pictures of their dugout during Game 3 of the American League Division Series against Houston. The end result is a poorly kept secret within the industry now spectacularly becoming public on MLB's biggest stage. There has been incessant chatter surrounding Houston's apparent envelope-pushing stealth behavior this summer, with several sources acknowledging to B/R that the talk increased significantly over the past few weeks. One industry source with direct knowledge of the Astros says they have been actively engaged in trying to steal signs by regularly scouting locations to film in various ballparks. The person says that the only way to successfully do so is exactly what the Astros currently stand accused of: obtaining pictures of those signs from the camera well next to the dugout. The key advantage in that tactic is the angle of access, which, in this case, would allow for a look deep into the opponent's dugout, where most signs originate. A manager standing in plain view, for example, rarely gives signs. More often, they come from the bench coach, or another coach, signaling the catcher from the bench lining the back of the dugout. From there, video equipment surreptitiously placed in various stadium locations cannot adequately capture those signs. But a man standing in the camera well next to the dugout and aiming video equipment directly into the bench area, as the man identified by Yahoo Sports as Kyle McLaughlin was doing, can capture all sorts of secrets. "They're absolutely up to no good, or good, depending where you stand on the argument," one industry source said. "They're up to stuff." Said another industry source: "Look at the last series," referring to Houston's three-game sweep over Cleveland. "Look at the Mike Clevinger game (an 11-3 Houston win in Game 3). He's all arms and legs and hair, and it's like they [still] knew what was coming." Despite how well he pitched, the source questioned why the Houston hitters appeared so confident in their approaches at the plate. Another person pointed out the way Houston mauled Cleveland's Trevor Bauer in the same game, ambushing him for four hits and three runs in 1.1 innings after he relieved Clevinger. "It would be one thing if it stood out with one pitcher," the person said. "But it's others, too." 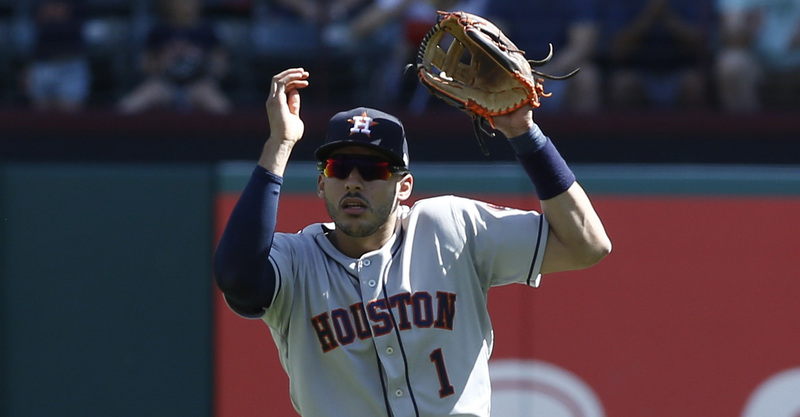 A third source, an executive with an American League club, points to Game 2 of last October's World Series, when Jose Altuve and Carlos Correa led off the 10th inning with back-to-back home runs against Josh Fields, and Yuli Gurriel followed by smashing a double that drove Fields from the game. "Now Fields used to be with Houston, so maybe he was tipping his pitches. But it just seems strange. They were taking some swings at times in that World Series that they shouldn't have been taking." Under Jeff Luhnow, who took over as general manager in December 2011, the Astros have been at the forefront of baseball's move into analytics. And as they've aggressively repositioned the organization in the computer world, fairness dictates that we mention how they've ruffled many feathers along the way. They've fired dozens of scouts over the past few years, and those moves have built a large degree of antipathy toward the Astros. Included in that bloodletting was Bobby Heck, who, as scouting director, led legendary Houston drafts between 2008 and 2012 that brought, among others, Dallas Keuchel, Carlos Correa, George Springer, Lance McCullers Jr. and J.D. Martinez into the organization. "As smart as Jeff is, he's smart on the devious side as well," one source says. "He's very smart and very thin-skinned." Bad blood between Luhnow's former employer, the St. Louis Cardinals, and the Astros reached an apex when a Cardinals scout named Chris Correa was sentenced to federal prison for hacking into the Astros' computer system. And when news of the Astros' alleged spy being caught in Fenway Park broke on Tuesday night, Correa sent out a tweet mocking Luhnow, his old adversary. According to B/R sources, multiple clubs tipped off the Indians before the Houston-Cleveland series to watch what the Astros were doing, because devious technological behavior was suspected, and, in turn, the Indians warned the Red Sox to be on the lookout during the ALCS. "The Astros will do anything and go to any length to try to win," one industry source says. "I don't fault them for that, because you can't tell me the Indians, the Yankees and the Red sox aren't trying to figure out how they can steal signs, too." For the Astros' part, Luhnow told reporters on Wednesday, "We do it every stadium we go into. We dispatch someone from the travel party to go out to center field, look at a particular area that might be suspicious or a certain monitor. I'm sure other clubs do this as well, but we're just trying to protect ourselves the best we can." MLB seemed satisfied with that line of reasoning, issuing a statement that tried to put the controversy to bed in asserting: "A thorough investigation concluded that an Astros employee was monitoring the field to ensure the opposing club was not violating any rules. All clubs remaining the playoffs have been notified to refrain from these types of efforts and to direct complaints about any in-stadium rules violations to MLB staff for investigation and resolution. We consider the matter closed." The Red Sox did not avoid punishment last year, though, when they were caught in an effort of new-age espionage. Busted by the New York Yankees for using an Apple Watch to relay stolen signs during a game, the Sox were fined an undisclosed amount by the commissioner's office. Sign-stealing has existed nearly as long as the game of baseball has been played. Teams have been working to decode signs for fastball or curve, signs to tip off when a stolen base or a hit-and-run might occur, since the days of Ty Cobb. But it is forbidden to use technology to do so. Now, with technology rampant throughout all levels of the game, the commissioner's office has an enormous challenge on its hands in keeping up with the cheaters. And some suspect the Astros to be guilty of more than just sign-stealing. Earlier this year, Bauer questioned how his old rival Gerrit Cole could suddenly increase spin rate after Houston acquired him from Pittsburgh. There have also been whispers throughout the industry that the Astros are not calibrating their TrackMan (a ball-tracking data system) properly throughout their organization, particularly at the minor league levels, which according to another industry source, can make it appear as if a particular pitcher's spin rate is too high or too low. "Then you get him, and you're like, 'Hmmm, why doesn't his fastball spin like we thought?' That was going around the industry earlier in the year. And when you add it to the whole pie, it's certainly plausible. MLB is going to have to take over oversight of TrackMan systems [and other areas]." Already, the league has started recording bullpen phone conversations in case a situation arises in which it needs to monitor or investigate a talk between the dugout and the bullpen. Former New York Yankees manager Joe Girardi and Colorado Rockies skipper Bud Black are among those who advocate the installation of an NFL-style communication system involving microphones and earpieces that would allow catchers and pitchers to communicate and settle on pitches without signs. Girardi would like the same for communication between batters and third-base coaches, which would eliminate the need for signs there, too. Most games this postseason are checking in at close to four hours in length. And much of the time is in pauses for pitchers and catchers to change signs or make sure that they are on the same page on whatever set of signs they've checked down to. Because while the smoking gun currently is pointing in the Astros' direction, the paranoia is across the board. No team fully trusts its opponent to play fairly in this age of technology. As one executive says, "I hope MLB doesn't sweep this under the rug."